As in previous years (see NGO Monitor reports for 2015, 2014, 2013, 2012), non-governmental organizations (NGOs) and well-known charities have been exploiting the Christmas season to demonize Israel and work against peace. Groups such as the World Council of Churches, Sabeel, Kairos Palestine, PAX Christi, Wi’am, Christ at the Checkpoint, and Amos Trust are again using religious and holiday themes to demonize Israel. These groups draw comparisons between the historic times of Jesus and current times, in attempts to equate the actions of the Israeli government and evil regimes of the past. These holiday messages and “Christmas alerts” generally omit any reference to Palestinian violence against Israeli citizens, placing sole blame on Israel for the ongoing conflict. These groups condemn the security barrier near Bethlehem, while omitting the wave of Palestinian terror originating from this area. With this abuse of holiday and religious symbols, these NGOs and charities that claim to promote moral agendas are not offering messages of peace and good cheer. Rather, their messages of intolerance exacerbate an already polarized and violent conflict. Kairos Palestine is an NGO that promotes the 2009 Kairos Palestine document, drafted by a small group of Palestinian Christian clergy. The document characterizes terrorist acts as “armed resistance” and “Palestinian legal resistance,” denies the Jewish historical connection to Israel in theological terms, seeks to mobilize churches worldwide in the call for BDS, and compares Israel with the South African apartheid regime. The 2016 “Christmas Alert” distributed by Kairos Palestine alleges that “2000 years ago, Bethlehem and Palestine suffered a harsh and unjust Roman military occupation. Today, Palestinians suffer the brunt of a 50 year-long Israeli military occupation.” It also includes multiple articles on Palestinian children, including from the anti-Israel NGO calling itself Defense for Children International-Palestine (DCI-P)1. The Alert accuses Israel of committing physical and psychological violence against children, while making little reference to Palestinian violence and omitting Israel’s right to defend itself and its citizens. Rifat Odeh Kassis, who is also a DCI-P leader, wrote the introduction for the Kairos Alert, accusing Israel of “extrajudicial executions” and of denying basic rights to Palestinian children arrested under charges of “usually, stone throwing,” which can be lethal. H.B. Michel Sabbah, Patriarch Emeritus of the Roman Catholic Church, wrote a prayer for the children, referring to Israel as the children’s “jailors” and as “those who obstinately want us to remain in war, death, under occupation and humiliation.” Sabbah blames Israel for the conflict, and claims that “No on incites” the children. Sabbah is also an author of the 2009 Kairos Palestine document. The document refers to terror attacks as having “allegedly” taken place, and, without evidence, accuses Israel of arresting and killing Palestinians. The holiday booklet contains an “imagined letter” from a Palestinian child killed in Gaza, exploiting suffering to promote conflict. The letter praises the work of Zochrot, a highly politicized Israeli NGO that supports a “One State Solution” or a “de-Zionized Palestine,” and refers to Israel as having an “ethnicized and racialized Zionist” system. An article prepared by the Society of St. Yves accuses Israel of violating international law and committing “psychological violence” against Palestinian children. UK-based Amos Trust published an “All-Age Christmas Activity Pack” indoctrinates children with a theologically themed message to promote anti-Israel propaganda. The World Council of Churches (WCC) is a collective of “347 churches, denominations and church fellowships in more than 110 countries and territories.” The WCC has established several highly biased and politicized subgroups, including Ecumenical Accompaniment Programme in Palestine and Israel (EAPPI). It also promotes the Kairos Palestine document. 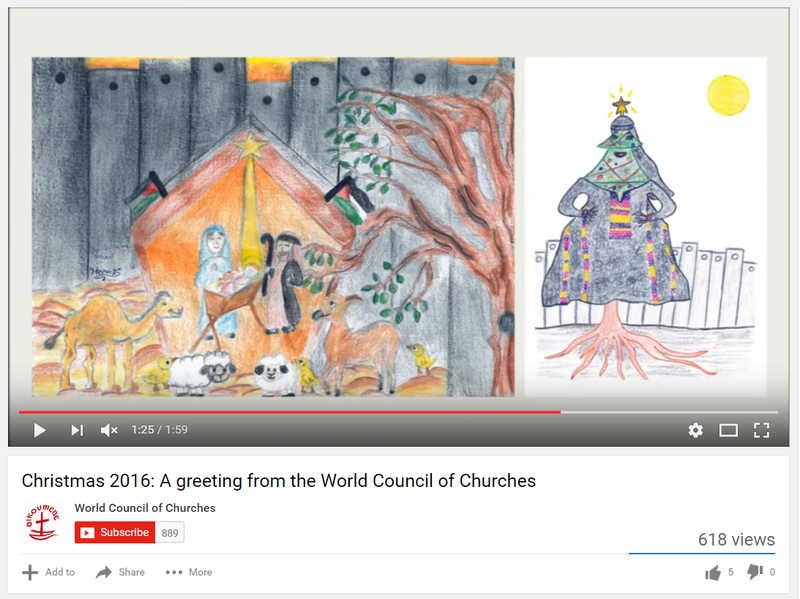 WCC’s 2016 Christmas greeting was made by children in Bethlehem. The document describes “the limitations and even threats to their lives through the ongoing occupation with its walls and wires.” In the video greeting, there are several images of EAPPI activists and Israeli security personnel, as well as a drawing in which the nativity scene takes place in front of the “Separation Wall,” flanked by Palestinian flags. Christ at the Checkpoint was founded by the Bethlehem Bible College. The bi-annual Christ at the Checkpoint Conference regularly features representatives from highly politicized NGOs and employs rhetoric accusing Israel of “ethnic cleansing,” erecting an “apartheid wall,” and enacting a “crucification system” against the Palestinians. Released a video telling “the story of Christmas from Bethlehem.” In it, individuals explain that Mary and Joseph would not be able to enter Bethlehem today “because the big wall is close to Bethlehem. He’ll want a permit from Israel.” Jesus is also compared to modern-day refugees. DCI-P is a political advocacy NGO that support BDS campaigns against Israel. Several current and former board members of DCI-P have strong ties to the Popular Front for the Liberation of Palestine terror group.